Right now is a very stressful time for me life- and future-wise and I've noticed that the days when I'm generally crabby are usually stretches of time I haven't worked out. I've figured out that if I haven't done anything active in three straight days, then my mood goes considerably downhill. So I've been biking and generally exercising a lot more lately to prevent those feelings of unhappiness. I have a very sedentary job (and lifestyle) so on days when I don't do much of anything physically, I get antsy and feel the need to move around. A few months ago I would have been content with sitting around all day, but not anymore. It's like a crave exercise, which is a weird feeling for me. Part of this need to exercise is due to not wanting to lose all the fitness I've worked so hard to get. While I don't mind being unfit on a bike (I don't like it by any means, but it's not entirely terrible), I absolutely hate being out of shape when running. I've mentioned before that most of the activities I like to do require some sort of run fitness, so I can't afford to become out of shape because I will just have to start over. And beginning to run after some time off is excruciatingly painful for me, mostly mentally and less so physically. So that fear of having to start over is enough to get me out the door to run a dreaded hill at least once a week. 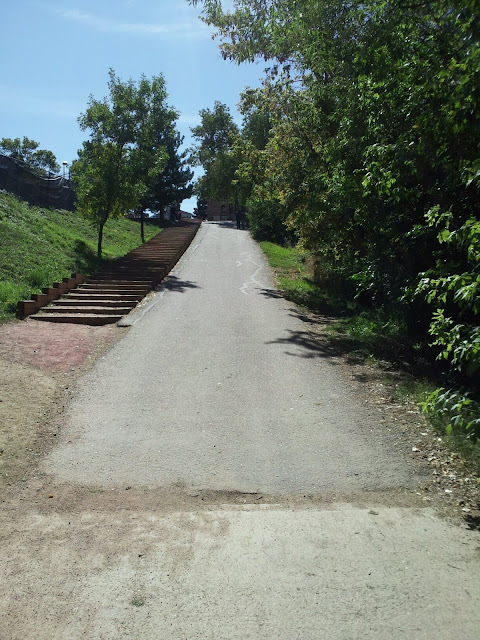 The dreaded hill and stairs that are my Tuesday nemesis. Although I talk so much smack about this hill, there is a positive side to running it weekly: I don't have to do distance runs to get in better shape. I can get the torture that is running out of the way quickly. So far I've been running the stairs 5 times then the hill 5 times, and it takes me about 20 minutes to finish the whole workout. Short and sweet, just the way I like it. I've been doing this for the past three months and I've noticed that it's becoming, dare I say, easy. So last week I gave myself a cutoff time for the stairs (20 seconds) and another one for the hill (25 seconds) and did each one until I couldn't make the cutoff time anymore. I wanted to see by how much I should increase my workouts since I feel like I can go longer now. I made it to 7 up the stairs, and 7 up the hill. So that's what I'm going to do for the next couple of weeks and then do this "test" again. I may not be going faster than before (which is another problem I'll discuss in a future post), but I can definitely do more of these consistently. That's another NSV (Non-Scale Victory) I'm very proud of!